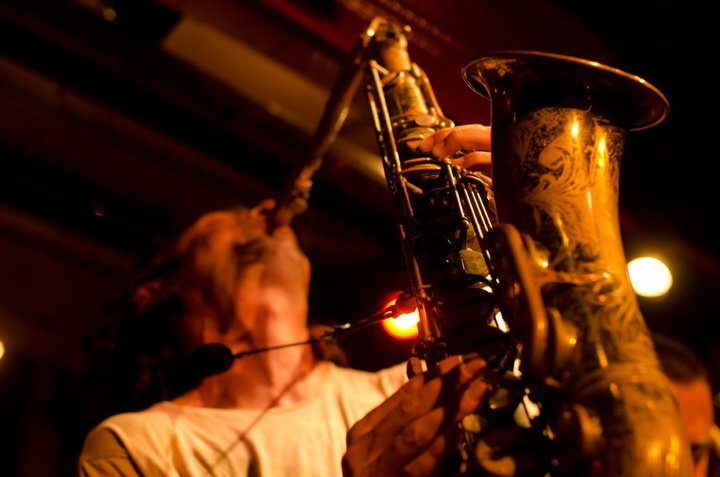 Saxophonist, composer and educator Jonathan Moritz was born in Teheran, Iran in 1977. At an early age he moved to Southern California with his multicultural family of Persian, Jewish, Belgian upbringing and was surrounded by weekly family gatherings rich in dancing and dombak drumming that filled the house with the joy of improvisation. He moved to Belgium, where his paternal family lives, to study at the Royal Conservatory of Brussels ('95-'98) focusing on solidifying an academic foundation of straight ahead jazz. Drawn back to the West Coast, Moritz finished his BFA in Jazz Performance at California Institute of the Arts ('98-2000), combining his knowledge of jazz academia with the creative spirit of the family jams. Here he collaborated with dancers on projects like Noisy Clothes where he met French designer Elodie Blanchard, who became his wife. Jonathan Moritz has lived in Brooklyn with Elodie Blanchard and their son Gaspard since 2000 and has been performing and working professionally throughout New York City since. As an educator he has led workshops on improvisation at the Oakwood High School in Los Angeles, the University of Michigan in Ann Arbor and ISIM at UCSD, has directed an instrumental music program at the Morris H. Weiss School for the past 10 years and graduated from Brooklyn College (â€˜07) with a Master Degree in Music Education. Since 2005, Jonathan and Elodie have curated one of New York's most intimate and welcoming performance spaces, the Prospect Series, a house concert featuring innovative improvisers, Persian stew, a diverse audience and French hospitality. And venues such as: Issue Project Room, Roulette and The Stone, Zebulon and Barbes. Jonathan Moritz's Secret Tempo concentrates on modernizing the roles with an artistic focus on harmony, indeterminate rhythms, extended technique and a deep exploration of sound. Loaded with cadenzas, fermatas, solo breaks, counter rhythms, and codas this album is often free sounding but is surprisingly, highly arranged.